SCVHistory.com | Newhall | Soldiers Spark Brush Fire that Rips Through Fox Farm, Surrounds Hart Mansion, July 1942. Soldiers Spark Brush Fire that Rips Through Fox Farm, Surrounds Hart Mansion. Lassalle Canyon (aka LaSalle), where the fire reportedly broke out, was located on the south side of today's Calgrove Boulevard and east of Highway 99 (The Old Road). There was no Interstate 5 freeway. It's seven months after Pearl Harbor. We don't have details on the military training exercises, although we do know Army aviators trained in the skies overhead throughout the war. Five Fires Denude Southland Areas. Ranch Home Left in Ruins by Raging Flames. Thousands of Men Win Battles Against Worst Outbreaks of Season, Covering 14,000 Acres; BLaze in San Diego County Still Fought. Los Angeles Times | Thursday, July 9, 1942. [...] Meanwhile, 200 men headed by Pierre Daries, Soledad division chief for the County Forestry Department, were sent home from the fire lines near Newhall, where more than 1,000 acres were burned in the Happy Valley area. This fire, which began Monday, consumed the four-room frame house of Will Lockwood, burned two smaller dwellings and killed three silver foxes at the Wildwood Fox Farm. More than 120 other fur animals were rescued by William Lee, caretaker. The home of William S. Hart, onetime film cowboy actor, escaped destruction by the fire, although considerable damage was done. The fire burned to within 40 feet of his residence, Hart reported. The fifth fire was a small outbreak near Gorman on the Ridge Route. This was doused promptly by county forestry men before it had burned over more than a single acre. Damage Small in Record Brush Fire. Flames started by military target practice, race 2 miles in 40 minutes. Hart home surrounded, but saved. The Newhall Signal and Saugus Enterprise | Friday, July 10, 1942. Racing with a speed and burning with a fury which eclipsed anything seen in this area in the last 20 years, a brush fire starting on the Lassalle ranch Monday afternoon, came across two miles of hilly brush country in 40 minutes, and was only halted at the gates of Newhall by the united efforts of hundreds of fire fighters and citizens. 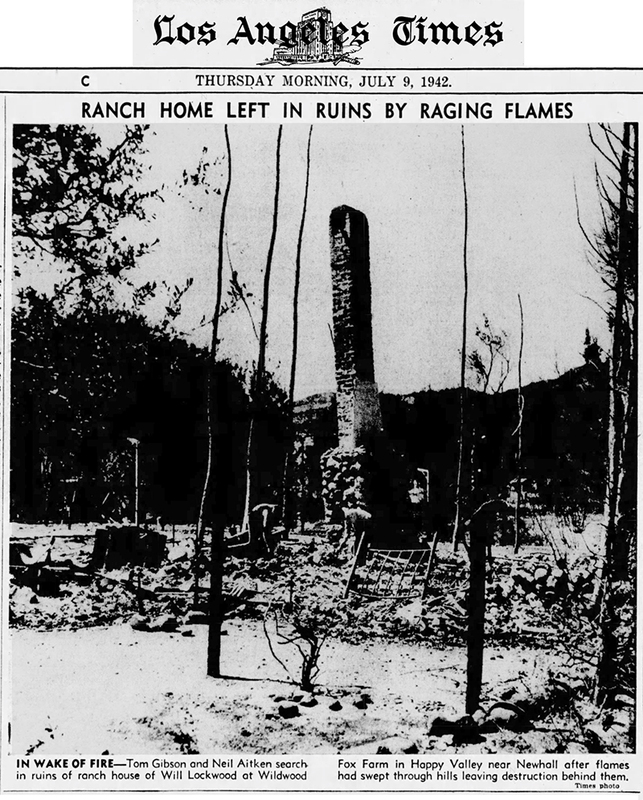 The structural damage was comparatively light, the only dwelling destroyed being that on the Lockwood Fox Farm in lower Wildwood Canyon, but the damage to trees and natural growth, particularly on William S. Hart's Horeeshoe ranch could not be estimated. The fire was truly a war fire, and gave Newhall its first taste of what war may be like if incendiary bombs should be dropped in the area. It started after a company of soldiers had been engaged in target practice. Although the greatest care is taken to keep tracer bullets out of the practice rounds, a small fire appeared behind the target after about 50 rounds had been expended. The soldiers immediately went over and stamped this fire out, or thought they had. However, a few moments later, fanned by a strong west wind, the fire leaped up in the brush, and began racing eastward toward Newhall. The alarm was phoned into Soledad Division headquarters at 3:32 p.m. Monday. The three pumpers at headquarters were immediately dispatched. The afternoon was one of the hottest of the year, thermometers standing at 110 to 115. The humidity was almost zero. A strong breeze from the west added the last thing needed for the worst possible state of fire hazard. In 20 minutes the fire had reached Wildwood Canyon, and was racing around the houses there. By 4 o'clock the fire had climbed to the top of the ridges on the west end of the Horseshoe ranch, and a half hour later it was threatening the Hart house itself. By the most strenuous efforts the residents of the Wildwood Canyon area managed to save their houses from the encroaching grass fires which ran all around them. The two houses on the Aitken property were saved by heroic work but the fire got into the fox farm by reason of the brush which had been allowed to grow around the place to provide cover for the foxes. No more dramatic spectacle was ever seen here than the battle to save the Hart mansion. After jt was seen that the Wildwood properties were in no pressing danger, three pumpers were dispatched to the Hart home. Here, like soldiers, encircled and besieged in a fortress the firemen fought successfully to save the property. The fire, roaring like an express freight train, rushed eastward along the top of the high ridge which forms the backbone of the Horseshoe ranch. Backfires were hastily started, and the pumpers hooked up to the water supply from the big reservoir above the house to wet down everything possible. But the oncoming flames scaled the hill and shot billows of fire a hundred feet above the roof. Crouching behind walls like soldiers behind parapets, the firemen held their ground and kept the hose streams going. From below hundreds of watchers groaned as the smoke and flames hid the house from view and the desperate shouts of fire fighters could be heard. Not only did the fire attack from the west slope, but it got around the shoulder of the hill and soon the mansion was completely encircled by fire. But the firemen stuck, and in a short time the white walls could be seen again, scorched and blackened but intact. Rushing down the south slope of the main ridge the fire came up to the Southern Pacific tracks in Railroad Canyon, threatened the Union Oil depot and the Southern California Gas Co. station. Railroad crews and firemen stationed on this line twice stamped out fires which got over the tracks and the highway, and held the defense intact. A shift in the wind about five o'clock coupled with the fact that the lines of defense were holding, eased the situation. The fire also came over the hills bordering the south side of West Market street, and the structures in Castle Cove [ex-Charley Mack's Crowland houses — Ed.] were saved only after a hard fight by a pumper from Chatsworth. The shift in the wind set the brush fire in the hills going in a new direction to the south and west. The brush burned until late Tuesday night, in isolated islands and the rugged country south and west of Newhall, but no further damage was done except to water shed cover. The fierceness of the fire and its speed alarmed everybody. People were still jumpy Tuesday when a smoldering fragment started a new blaze in the northeast corner of the Hart ranch behind the hedge which threatened the Thibaudeau property and other dwellings at this end of Newhall avenue. The fire was stamped out with no damage however. The Red Cross went into action promptly Monday afternoon with relief measures. Two station wagons came up from Los Angeles, the casualty station was opened and made ready for business, and Red Cross workers distributed sandwiches to the men on the fire lines. Some 200 fire fighters were engaged in batting the blaze at its height. In addition to the three pumpers from local headquarters, 8 more were brought in from other division, and five from the U .S. Forestry. Crews from all of the county juvenile camps were rushed into action. Luckily there were no serious accidents. County Forestry headquarters were engaged in a survey of damage yesterday. The most damage was at the Lockwood Fox farm, where a house and two small out-buildings were burned. Three valuable silver foxes lost their lives in the flames, but the balance of the 200 in the enclosures were saved. Many dwellings had narrow escapes. Earl Altkens' new house tinder construction on a hill back of his present house took fire, but was saved by the hard work of Mr. and Mrs. Aitken, Mr. and Mrs. Perkins and Hugh Page. A small storage building at the foot of the hill on the west side of the Horseshoe ranch was burned, as well as the old summer house and the roof of the hilltop reservoir. Some damage by heat took place at the main buildings, and a good deal of the planting about the main house and patio was scorched and withered. Total burned acreage was estimated at 850 acres. It is believed that wild life suffered greatly. The Horseshoe ranch is a game refuge containing many deer and other wild animals. In discussing the fire, [Forestry Division Chief] Pierre Daries pointed out that it had its advantages as well as its losses. Newhall is now safe from fire from the west for a long time, [he de]clared.